You've found the “U.S. English Spot Rabbit Breeders” page here at Hobby Farm Wisdom! If this is the first time you have visited our site: Welcome! 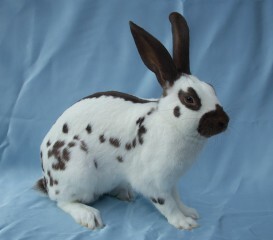 A medium sized fancy breed, the English Spot rabbit is highly distinguished by its colored marking on its body which includes: butterfly, eye circles, cheek spots, herringbone, colored ears, and chain of spots. There are seven color varieties of their markings aside from the white base color: black, blue, chocolate, gold, gray, lilac and tortoise. English Spot rabbits have a fully arched body with long front legs. They weigh between 5-8 lbs and upright ears. This is an active and curious breed which needs time to run around every day. They need to be fed leafy greens and hay, and are capable of growing fast and producing large litters.